CHICAGO -- Eclipse Select Soccer Club defender and Hinsdale South High School junior Jessica Mutters announced her commitment to play for Creighton University's women's soccer program starting in 2013. The Darien, Ill., native's older sister Danielle played for Missouri Valley Conference rival Illinois State, and her parents also attended ISU. But Jessica found everything she wanted in the Omaha, Neb.-based Creighton both on and off the pitch. "I wanted to go to a small private school that had good science -- I'm looking into majoring in biochemistry," Mutters said. "I've also gone to their summer camp for the past two years and have had a chance to interact with the team. Their coaches are really nice, and I got to play with or against the players running the camp and got a feel for the team. It was at the top of my list." Mutters will attend a Creighton side that posted a respectable 4-1-1 record in the MVC this past season. By the time Mutters takes the pitch, the Bluejays will have a younger defense and squad overall. The majority of the 2011 team's defensive line consisted of upper classmen, and nine seniors are graduating following Creighton's most recent season. A collegiate soccer path has been in Mutters' eyes since watching her sister at Illinois State. "Ever since I've seen my sister play in college, I knew I wanted to play," Mutters said. "I've been wanting it for years now, so this is a dream come true." For more about Eclipse Select, visit EclipseSelect.org. Eclipse Select Soccer Club alumna and former Notre Dame midfielder Jen Buczkowski is coming off a successful third season within Women's Professional Soccer. The 26-year-old Elk Grove, Ill., native was named to the 2011 WPS Best XI as voted by select media, and her Philadelphia Independence advanced to the WPS title match, eventually falling to the champion Western New York Flash. 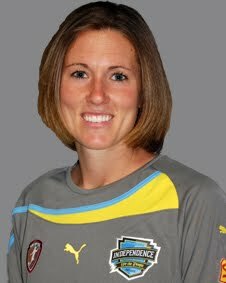 Independence head coach Paul Riley has called Buczkowski "the best pure defensive midfielder in the league," and she wants to return to Philadelphia for a third straight year in 2012. "I have not officially signed, but I have talked to Paul and [owner/CEO] David [Halstead]," Buczkowski said. "Many people have not signed, but maybe in the next week or two you'll see a lot more signings. But the plan is to stay in Philadelphia." Our Game Magazine took the time to interview L.A. Vikings President and head coach Robert Kleinberger. This winter the team has incorporated a heavily Women's Professional Soccer-based roster to face the U.S., Canadian and Mexican national teams. Former Eclipse Select Soccer Club players Brittany Bock (Western New York Flash) and Jen Buczkowski (WPS free agent, played for Philadelphia Independence in 2010 and 2011) are on the squad. Read about how this came together at OurGameMagazine.com. 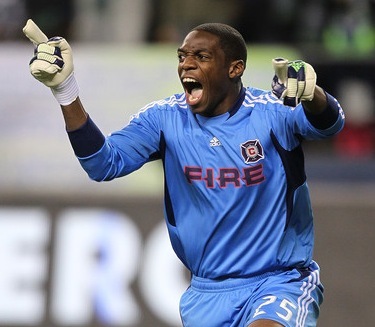 Chicago Fire goalkeeper Sean Johnson, who is entering his third season in MLS, has been called up by U.S. National Team head coach Jurgen Klinsmann for a January training camp. The session starts on Jan. 3 as the U.S. prepares for a Jan. 21 match against Venezuela in Glendale, Ariz., followed by a Jan. 25 game against Panama in Panama City. "I'm definitely excited about it," Johnson said. "There's a lot to look forward to in getting to play alongside the guys that are going to be there. We have two games to cap off the camp, so I think it will be good competition, and one that will help prepare for the season, as well." CHICAGO -- Eclipse Select Soccer Club alum and Robert Morris sophomore forward Gordy Gurson (Buffalo Grove, Ill./Stevenson) was named to the 2011 NAIA Men's All-Mideast Team, the NSCAA recently announced. Earlier this month, Gurson also was named an NAIA All-America Honorable Mention as he made an immediate impact for the Eagles after transferring from Memphis. Among all NAIA players, Gurson ranked 12th in goals (18) and 16th in points (40). Gurson was the 2011 Chicagoland Collegiate Athletic Conference Player of the Year and he led Robert Morris to its first CCAC regular-season title. CHICAGO -- Former Eclipse Select Soccer Club player and coach Leslie Osborne was one of many Women's Professional Soccer players waiting to hear about the league's future this week. And for the past several months, Osborne's WPS franchise, the Boston Breakers, has been trying to secure additional ownership after majority owner Gary Loveman put his share of the organization on the market. Things are looking a bit better on both fronts now. The 28-year-old Brookfield, Wis., native and Breakers midfielder said on Wednesday that additional ownership is on board with Boston. And from a league standpoint, after WPS met with the U.S. Soccer Federation here in Chicago, the U.S. Soccer Board of Directors formally approved WPS's division one sanction request provided the league expands to minimally six teams in 2013 and eight teams in 2014. "It has been a long couple of months," Osborne said. "Boston had to find more investors for the team, magicJack was kicked out -- it's been a roller coaster for me. Personally, I was going to retire if the league was going to fold. If the league was around, I wanted to play in Boston. For me, [Tuesday's U.S. Soccer announcement] was just a blessing to continue to play and be the Breakers' captain. I'm excited. But I was ready in case it didn't work out." CHICAGO -- The Eclipse Select Soccer Club was ranked No. 2 in the country in Soccer America's 2011 Best Girls Clubs list, which was released Wednesday. Eclipse Select's girls finished runner-up for a fourth straight year, as the New Jersey-based Players Development Academy was awarded the top position. Eclipse Select has been the model of top-level excellence during Soccer America's annual rankings. The Eclipse Select Girls were ranked No. 1 by Soccer America in 2006 and 2007, followed by No. 2 rankings from 2008 through 2011. The Chicago Fire chose forward Kheli Dube with their selection in the second stage of the MLS Re-Entry Draft on Monday. The 28-year-old Dube tallied 14 goals and eight assists in 72 games with the New England Revolution, and the Fire now begin negotiations with Dube on a contract. Dube only saw the pitch five times and logged 114 minutes in 2011. The Bulawayo, Zimbabwe, native was a regular starter for the Revs in 2009, starting in 20 of 26 games played and tallying a personal-best eight goals that season. CHICAGO -- Eclipse Select Soccer Club alumna and Lee University sophomore midfielder Leah Fortune (West Chicago, Ill./Wheaton Academy) was named to the NAIA Women's All-America First Team, which was announced last week by the National Soccer Coaches Association of America. Fortune capped off her 2011 season with a goal and an assist during Lee's 3-0 NAIA national championship victory over Concordia (Ore.) on Dec. 3. The Lady Flames were 23-2-0 on the season, becoming the first women's soccer program to win four straight NAIA national titles. Fortune began her collegiate career with the University of Texas, then transferred to Lee University, which is based in Cleveland, Tenn.
"I thought Leah Fortune made a huge impact on our squad this year," Lee head coach Matt Yelton said in a release. "Over the course of the year she improved so much from game to game and day to day, and absolutely played her best soccer of the season down the stretch in the national tournament." 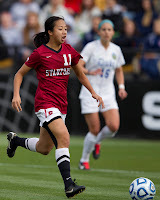 CHICAGO -- The third time was the charm for Eclipse Select Soccer Club alumna and Stanford junior defender Rachel Quon (Lake Forest, Ill./Lake Forest). Quon and the Stanford defense posted its 18th shutout of the season, none bigger than Sunday's 1-0 win over Duke to win the NCAA Women's College Cup in Kennesaw, Ga.
Quon was part of Stanford's 2009 and 2010 teams, which advanced to the College Cup only to suffer 1-0 championship game losses to North Carolina and Notre Dame, respectively. But this year was different as the Cardinal posted a 25-0-1 record this season and capped things off with the program's first national championship. "There were a lot of emotions afterward, I can't even explain it," Quon said. "I'm just proud of my team, that we were able to finish it off this year. This team has never worked this hard over the last year, going back to when we lost last year and coming back in the winter and spring. It's incredible that we finally got that championship." Quon topped her former Eclipse Select and Lake Forest High School teammate, Duke junior midfielder Nicole Lipp (Lake Forest, Ill./Lake Forest), to win the crown. Lipp was named to the College Cup All-Tournament Team, and she contributed a corner kick assist to cap off the Blue Devils' scoring during Friday's 4-1 semifinal victory over Wake Forest. CHICAGO - It is guaranteed that a former Eclipse Select Soccer Club player and a Lake Forest, Ill., native will win Sunday's NCAA Women's College Cup. 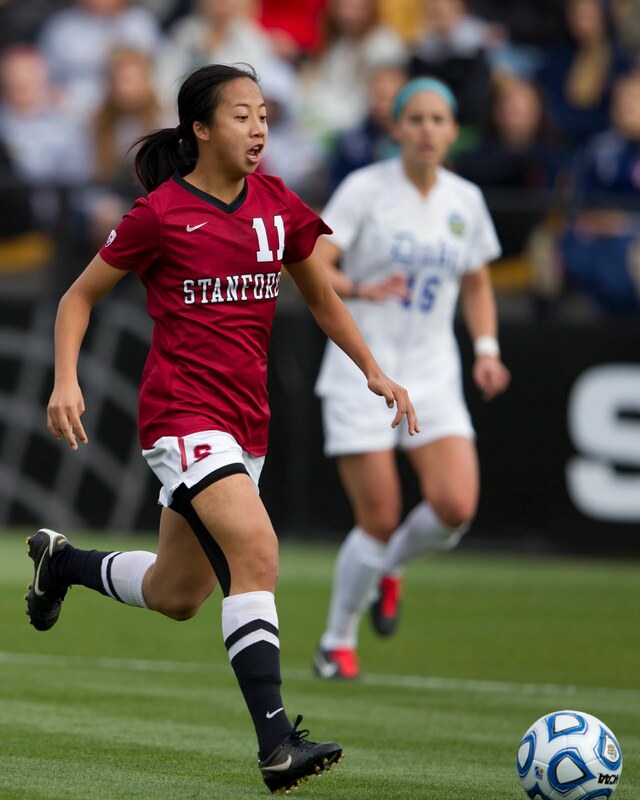 Stanford junior defender Rachel Quon (Lake Forest, Ill./Lake Forest) and the Cardinal advanced to the final with a 3-0 blanking of Florida State in Friday's first semifinal. In the nightcap, Duke junior midfielder Nicole Lipp (Lake Forest, Ill./Lake Forest) assisted the Blue Devils' final tally as Duke rolled to a 4-1 win over Wake Forest. Quon and Lipp were teammates at Eclipse Select and Lake Forest High School. Sunday's final kicks off at noon CT on Sunday and will be televised on ESPNU and available at ESPN3.com. 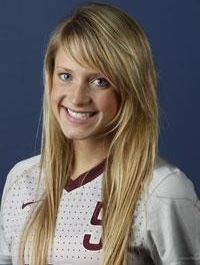 Among other Eclipse Select alumni participating in Friday's semifinal round, Florida State junior forward Jessica Price (Libertyville, Ill./Vernon Hills) logged 45 minutes off the bench for the Seminoles. And Florida State junior backup goalkeeper Taylor Vancil (South Elgin, Ill./St. Charles North) played five and a half scoreless minutes to close out the match against Stanford. For the latest College Cup news, visit NCAA.com. CHICAGO -- The NCAA Women's College Cup is all the buzz heading into the weekend in Kennesaw, Ga. Locally, there are Eclipse Select Soccer Club alumni playing for three of the remaining four teams as Stanford faces Florida State and Duke takes on Wake Forest in Friday's semifinal matches for the right to play for a national championship on Sunday. Eclipse Select alumni and Stanford junior defender Rachel Quon (Lake Forest, Ill./Lake Forest), Duke junior midfielder Nicole Lipp (Lake Forest, Ill./Lake Forest) and Florida State junior forward Jessica Price (Libertyville, Ill./Vernon Hills) had a chance to talk before Friday's semifinals. 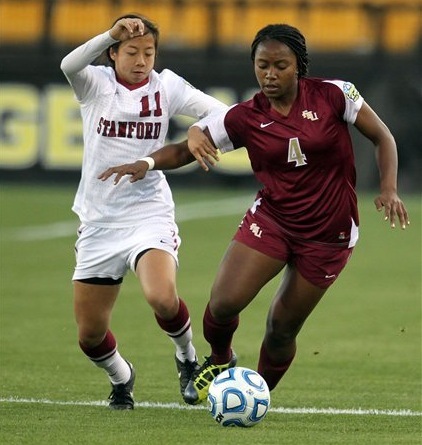 Stanford's Quon on her multiple back roles: "I played outside right back for the first two years and with Eclipse Select at outside right back. I started working on everything with my left this season because I just wanted to help my team out. If it meant moving to the left, I wanted to do it. I think having the experience of playing both sides helps. I have more confidence, and my teammates helped me with that transition." Duke's Lipp on seeing Eclipse Select alumni at this stage: "Honestly it's a credit to the coaches that not just one or two former players are here. I think it says a lot about the training that we got at Eclipse. The fact that we're all here and seeing some familiar faces compete against one another, without that training I wouldn't be here today." FSU's Price on returning from her ACL injury in 2010: "It was definitely really difficult to get ready physically and mentally again. I wanted to have a strong impact on the team and I just kept reminding myself to do the best that I can and get back. It was a typical ACL rehab -- six months or so. I got back on the field this spring, which was kind of a struggle. But this summer I got more comfortable." Chicago Fire goalkeeper Sean Johnson has noted in the past that he relates closely with Tim Howard's style of play in the goal. Now Johnson will train alongside the U.S. National Team and Everton goalkeeper. The Fire announced on their official site Thursday that Johnson is taking part in a week-long training session at Everton's Finch Farm training ground starting this Sunday and running through Dec. 10. "For a young goalkeeper like Sean, it's great that he's continuing to train and develop in the offseason," Fire head coach Frank Klopas said. "He'll be in a different environment where he can learn from a talented 'keeper in Tim Howard and go up against Premier League players. It benefits us as much as it does for him to have that experience."